For your own adventurous creation, try my seasonal recipe below, and be sure to provide your e-mail address on my contact page to be notified when new recipes are posted. I'm happy to answer any questions on these recipes. For the Shallots: Preheat the oven to 350 degrees. In an oven safe sauté pan, add butter, shallots and garlic and sauté for 2 minutes over medium high heat. Add sugar and coat shallots, then add fresh thyme and stock. Place the pan in the oven and roast shallots for 45 minutes. Remove and set aside. For the Reduction: In a small pot, add both wines, and stock. Lightly crush allspice, peppercorns, and juniper berries to release their flavor, and then add to the pot, along with the fresh thyme, and bay leaf. Reduce by half over medium heat (this could take about 1 hour). Once the reduction is reduced by half, pour it into the pan with the shallots and heat the mixture on medium high heat, until it becomes syrupy about 7 minutes. Then place a small strainer over a clean pot, and pour the shallots/liquid over the strainer, and discard the shallots, herbs, and peppercorns ( they have done their job). Reserve the sauce in the fridge overnight, if desired. For the rack: preheat the oven to 375 degrees. Remove the rack from the fridge an hour before cooking to bring to room temperature. Re-season the meat with a bit more salt and fresh cracked pepper. In an oven safe pan, heat olive oil over medium high heat. Sear the meat on both sides then place in the oven and roast, until desired doneness. I recommend cooking no further than medium rare (about 25 minutes). While the roast is cooking, place the reserved sauce back to the stove and re-heat. In a sauté pan, heat 2 Tbs. butter, and add blackberries and sauté for 2 minutes, then add sugar and sauté 1 minute more, then add the berries to the sauce. 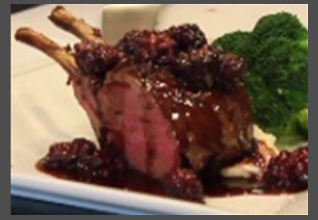 Carve the venison into servings and pour blackberry sauce over top.